"A beautifully crafted work that speaks to the loneliness of the traveler and the sadness of the displaced...performed with grace and lightness of spirit." "The best kind of solo performance, delivered by an artist with exquisite physical and emotional control. A multi-faceted theatrical journey to heartbreaking, war-torn landscapes.[... ]Virtuousic storytelling." In 1997, while living in Belgrade for six months to observe the work and creative process of Dah Teatar, Kathy Randels traveled extensively—for the first time on her own—throughout the countries of former Yugoslavia and the British Isles. Despite her innate desire for adventure and the fullness of her experiences, Randels found herself longing intensely for home. The End and Back Again, My Friend explores that desire and longing which reside—conflicted—within the human psyche. 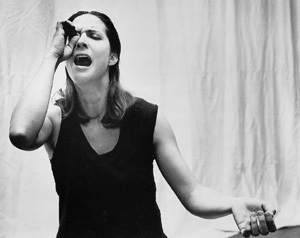 A solo performance created in 1998 with composer and fellow ArtSpot company member Sean LaRocca, The End and Back Again, My Friend is a collision of texts from Ernest Hemingway, Tennessee Williams, Homer's Odyssey, a Warrior's Creed by an anonymous 14th century Samurai, Randels and others. 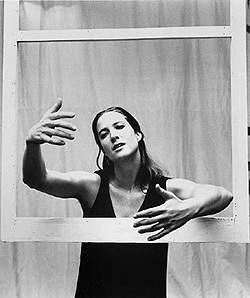 The guitar music for the piece features and repeatedly evokes Randels' beautiful original song Penelope, but also draws on traditional Balkan folk songs, Meredith Monk, and the blues. In The End and Back Again, My Friend, mythical figures meet modern humans in a search for home and country, belonging and understanding.